Let's have a game, shall we? I stole this from The Telegraph...photo by Kerstin Joensson/AP;. It is wrong to steal. I'm sorry, Kerstin, but this is a glorious photo and it deserves more people seeing it. As if lorraineonline is going to trump the Telegraph. Ha. But these are alpacas after they've been shaved. 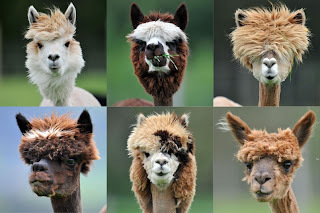 Alpacas make wool. Well, they don't call it wool. I'm sure they call it skin, or hide, or something. I'm sure they didn't sign up for humans to round them up and shave them for wool to make cardigans and scarves and things for people to sell to tourists to Argentina by the roadside. Yes, I bought some alpaca stuff once, in Argentina. Don't worry; the miserable little bastards get the last laugh: the stuff is itchy. Alpacas are not only funny looking, they spit. It's as if they know you're going to laugh at them, so they spit and beat you to it. I think we should name them. We can assign them letters, A B C D E F (anyone who can't figure out that order is too stupid to play). Nobody will know what that means, but trust me: I just lost 5 good friends. I cannot top that. You are awesome. Wish I had time to play the game... just heading off for 4 days. F) looks more like Mic Jagger to me. PS. I know 3 of the six names you proposed but only know what one of them looks like. And the resemblance is uncanny. If you knew OS, you actually know who they all are, Chris. I agree. David Bowie for C) First thing I thought of too jmd. Scary huh? If I could hear A) do a rendition of Hello Dolly, I might agree with that one too. They all look like Ramones to me. Except D, maybe not Bob Marley, but definitely Rasta.